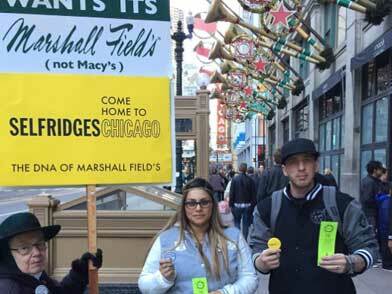 Thanks to all who made last Saturday's activities on State Street a success! 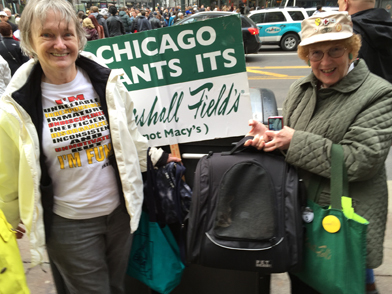 We had a couple of out of town vistors who helped--Charlie from Boston and Alfred from Washington, D.C. 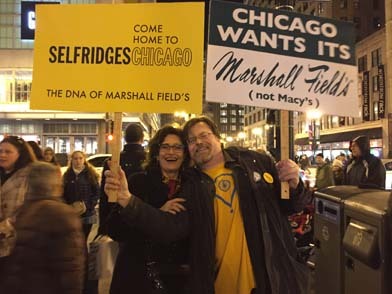 This was in addition to Lucie, Pete, Gail, and, of course, "gle". 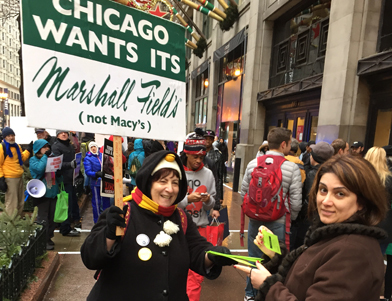 Below are photos from Noon-2 pm last Saturday, 12.19.2015. 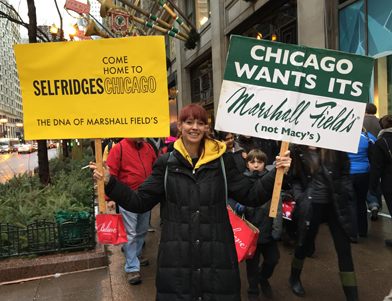 Come out this Saturday, 12.19.2015 from Noon-3 pm (and probably before & after) and pose with our signs! 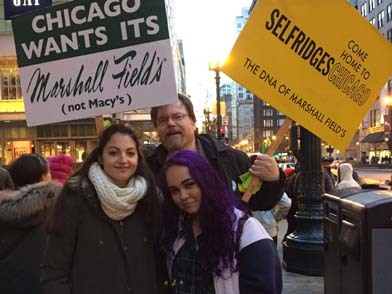 Sometimes we take short breaks, so call 312.662.8980 if you want to meet us at a specific time. 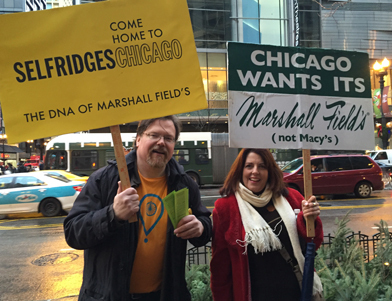 ALSO: Meet Author Gayle Soucek at Flat Top Grill, 30 S. Wabash, 10:30 am-1 pm. 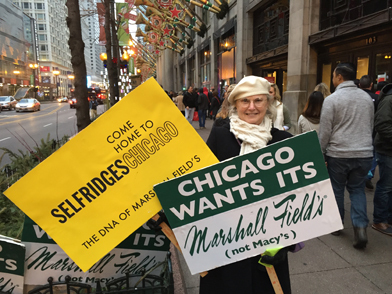 Copies of her new Selfridge book as well as her Field's & Carson's books will be for sale. 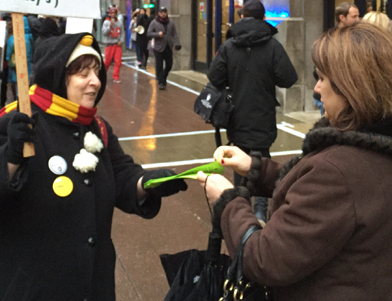 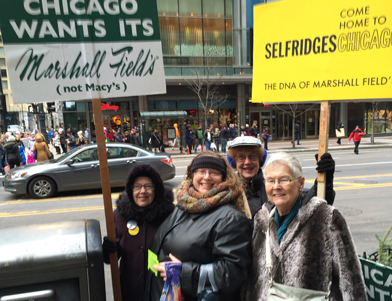 Below are photos from Noon-2:20 pm and 3-4 pm last Saturday, 12.12.2015. 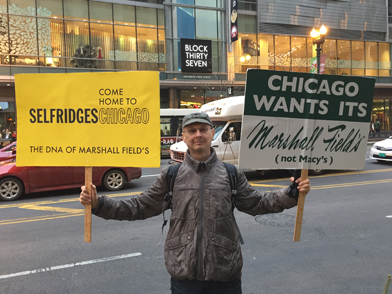 Come out this Saturday, December 12, 2015 from at least Noon to 2:00 pm (and probably before and long into the afternoon) and pose with our signs! 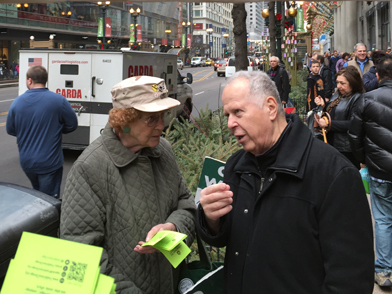 Sometimes we take short breaks, so call 312.662.8980 if you want to meet us at a specific time. 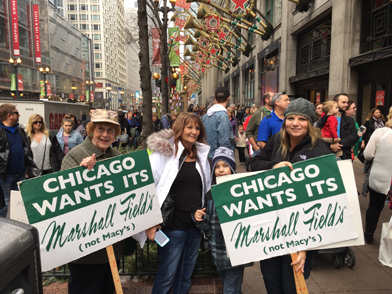 Below are photos from Noon-5 pm last Saturday, December 5, 2015. 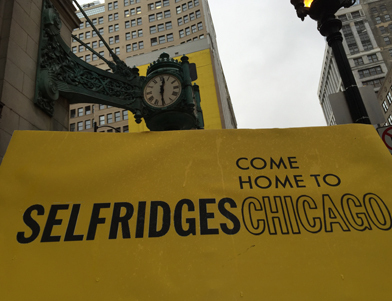 Come out on Saturdays and look for us under the clock. 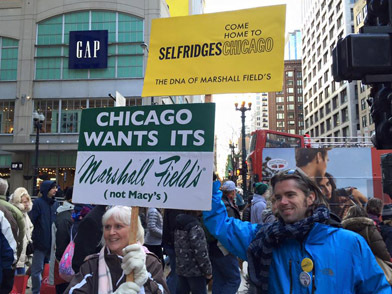 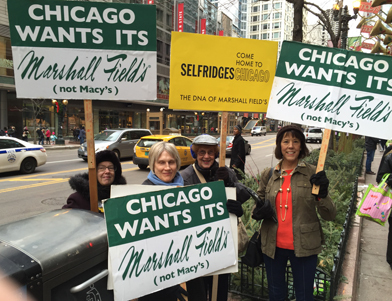 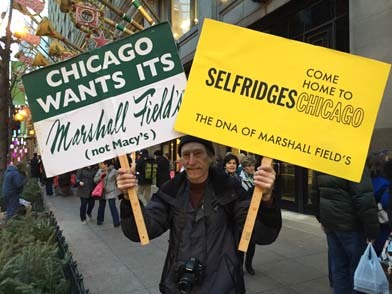 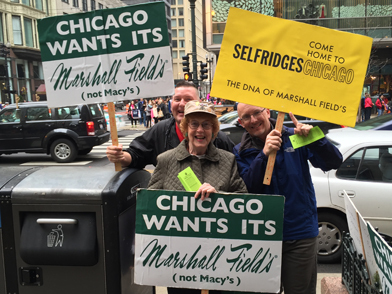 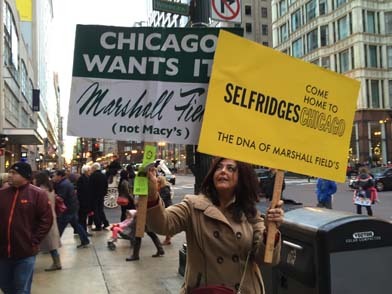 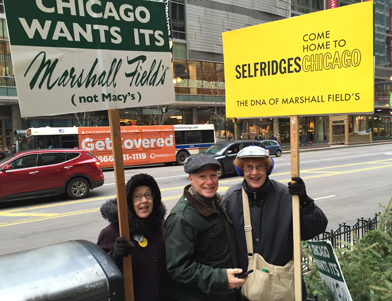 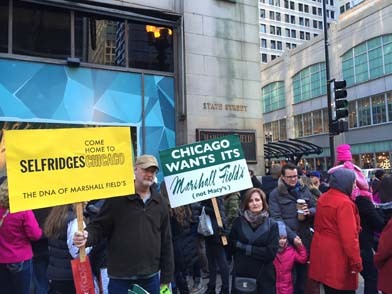 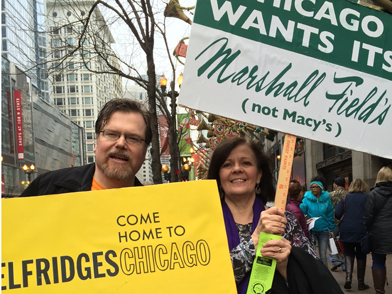 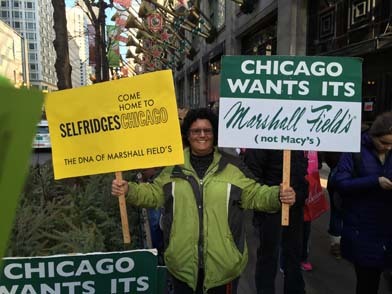 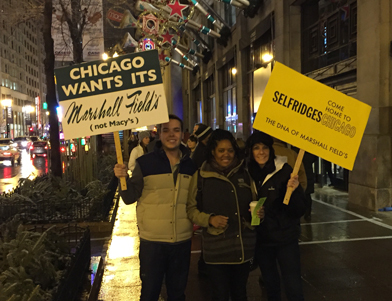 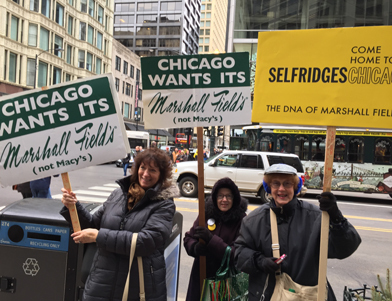 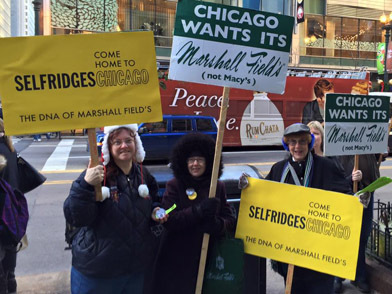 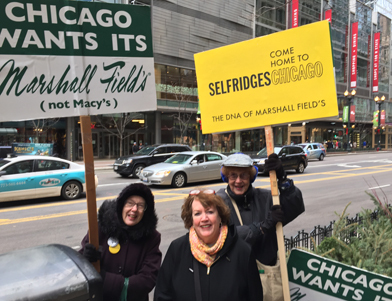 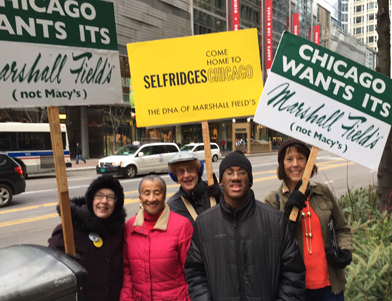 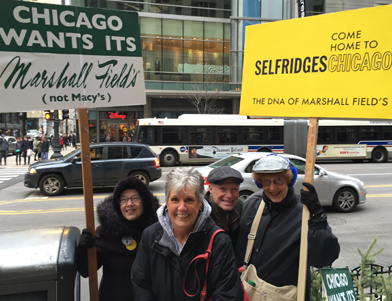 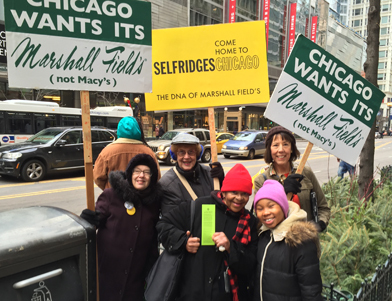 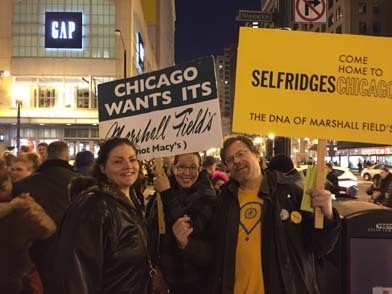 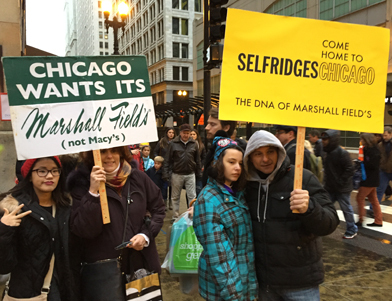 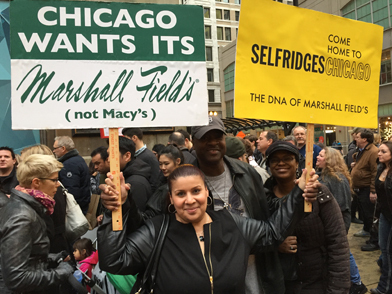 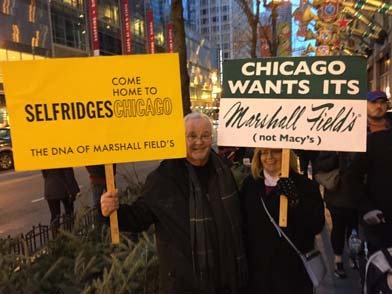 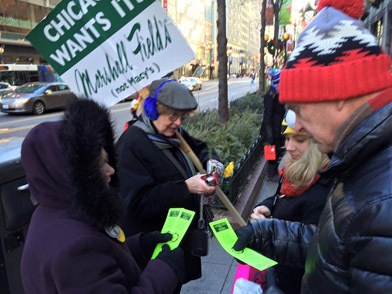 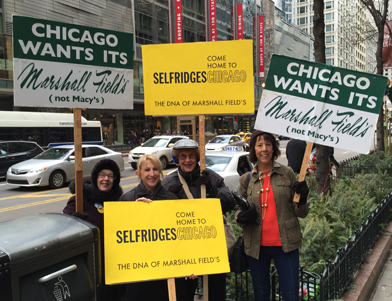 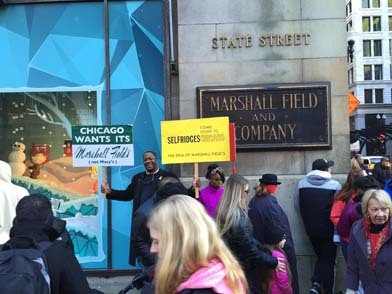 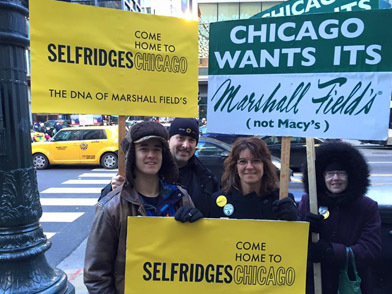 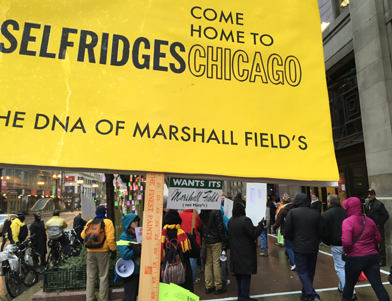 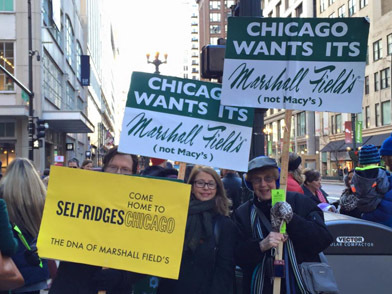 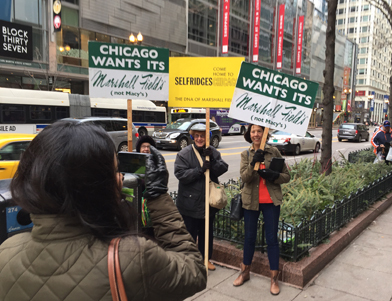 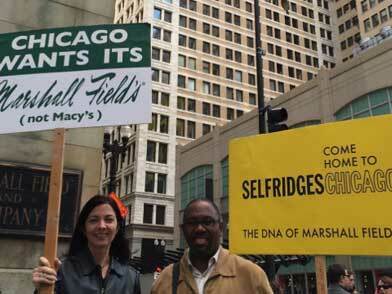 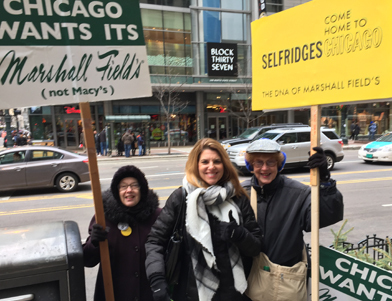 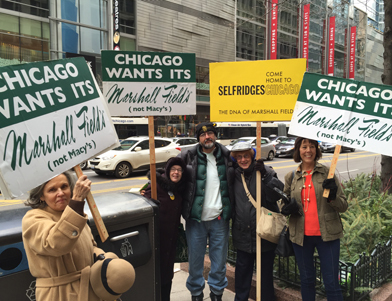 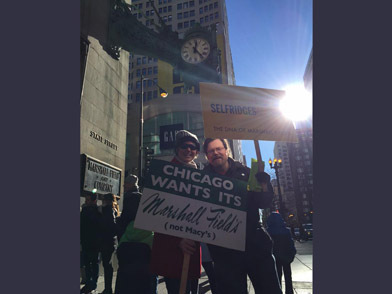 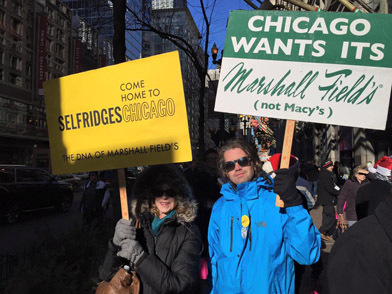 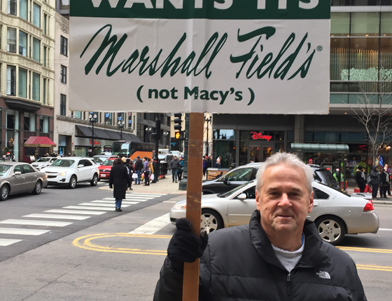 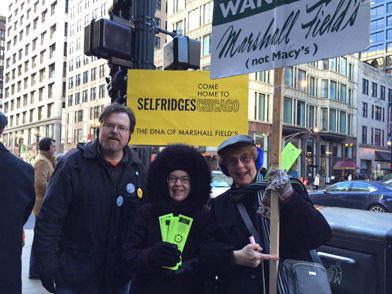 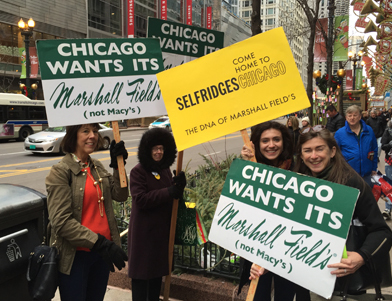 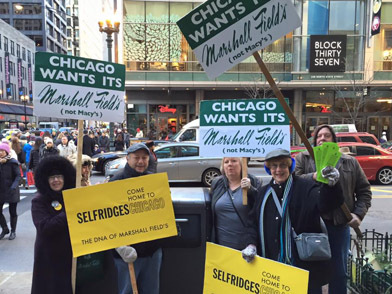 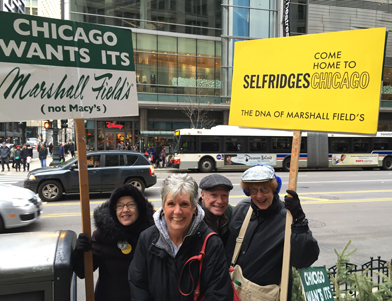 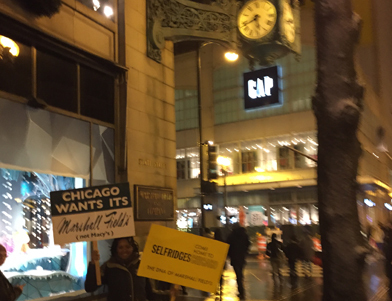 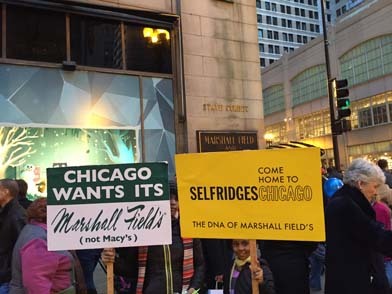 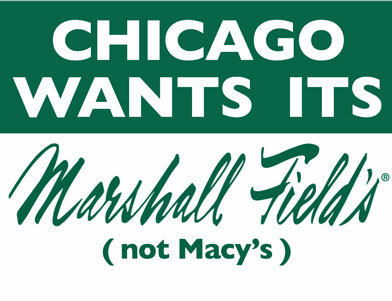 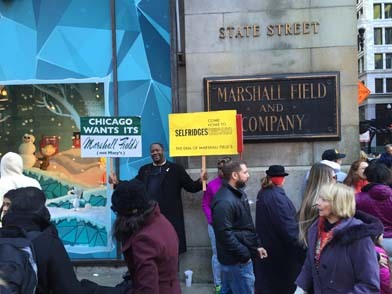 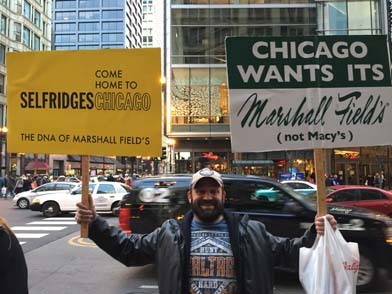 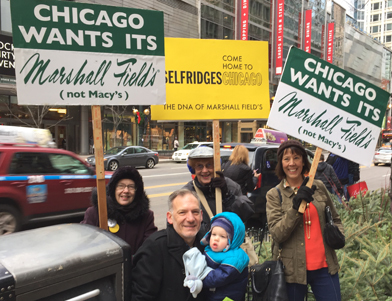 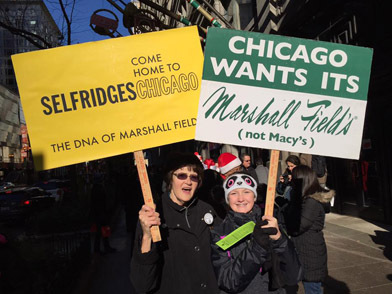 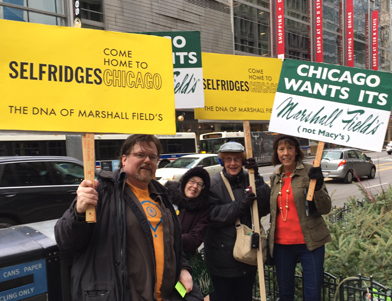 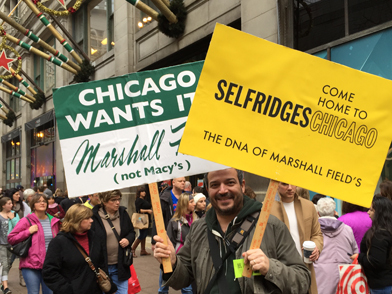 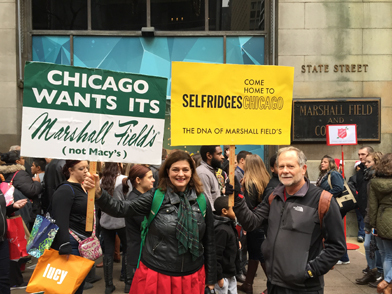 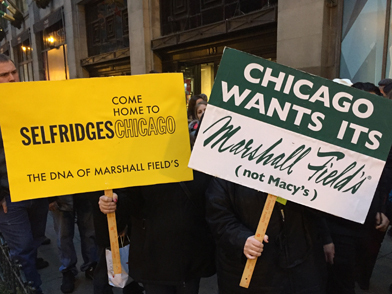 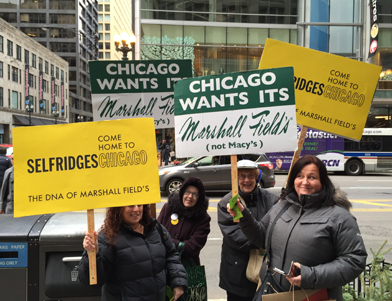 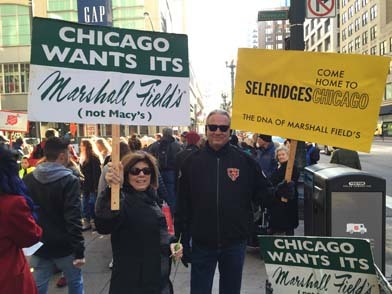 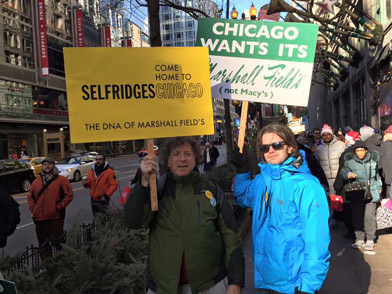 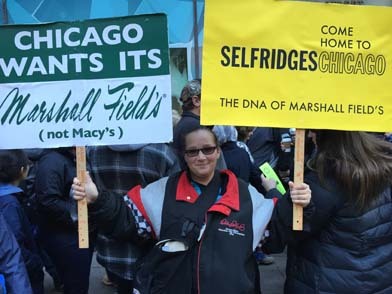 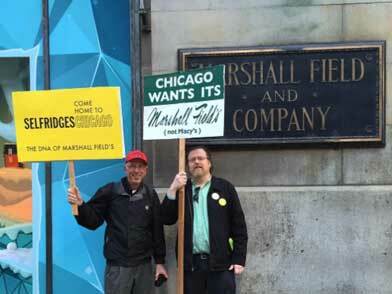 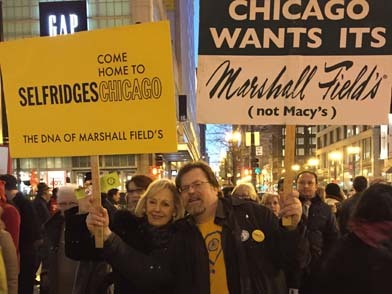 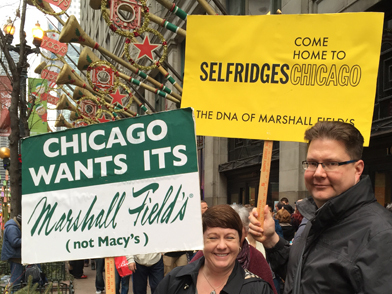 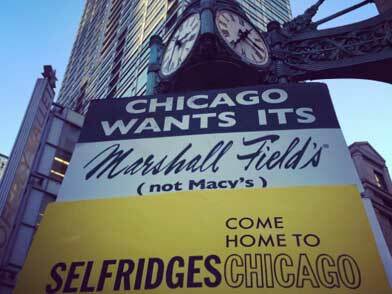 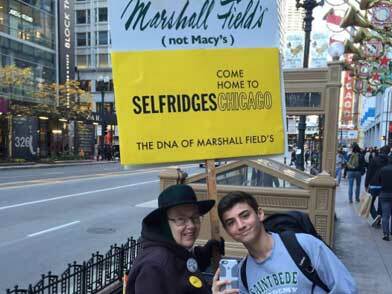 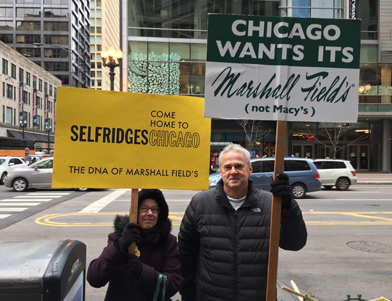 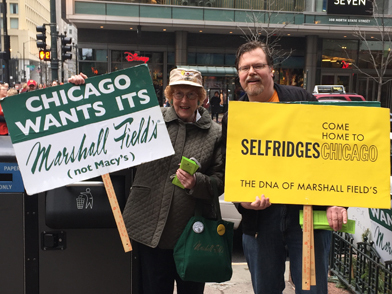 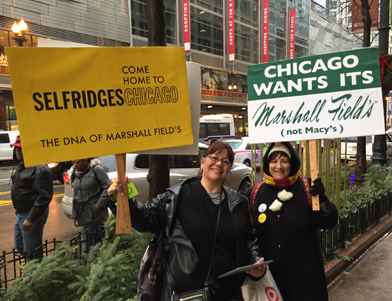 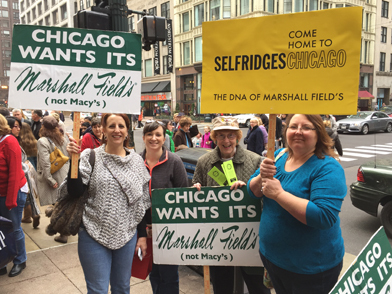 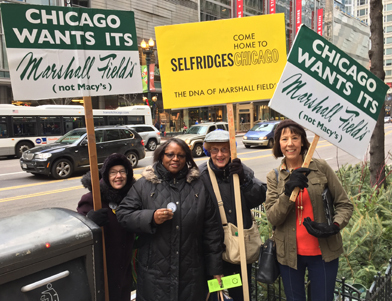 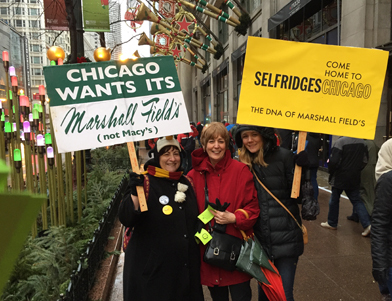 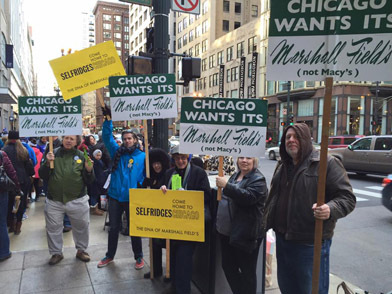 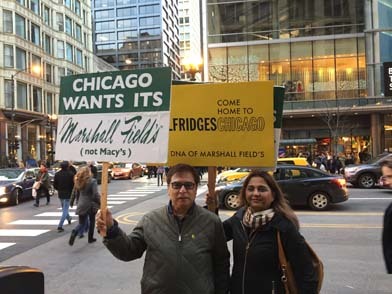 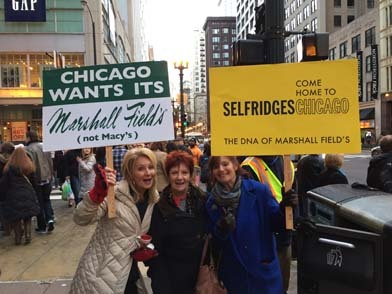 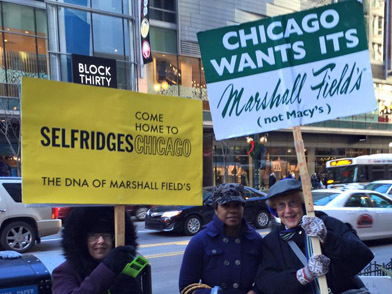 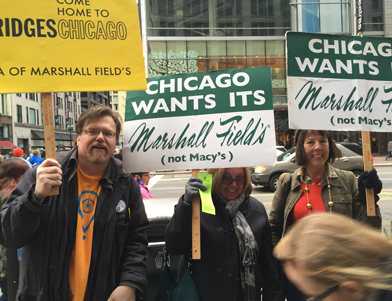 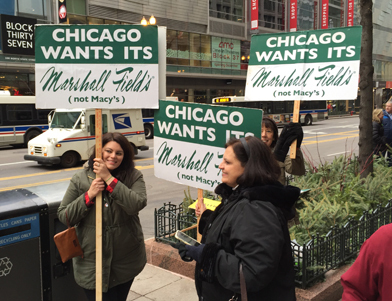 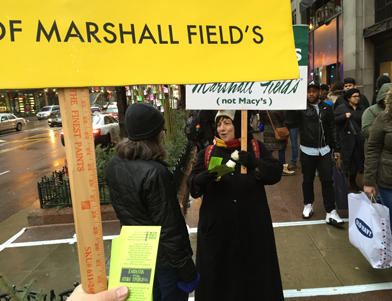 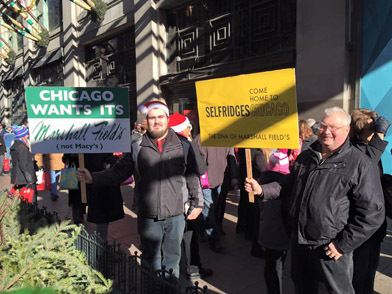 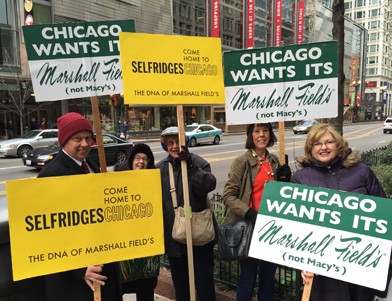 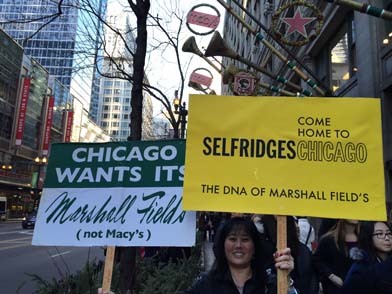 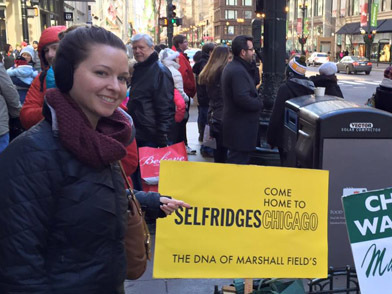 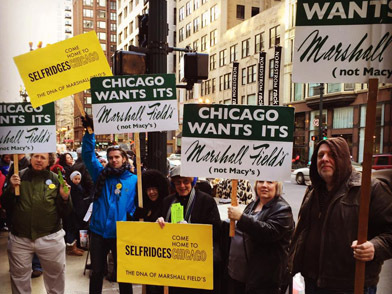 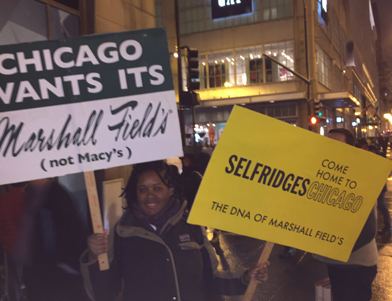 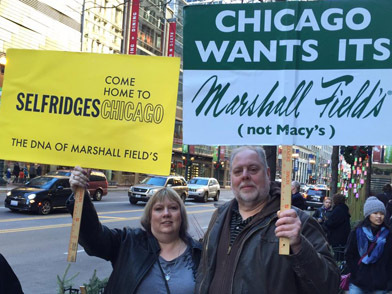 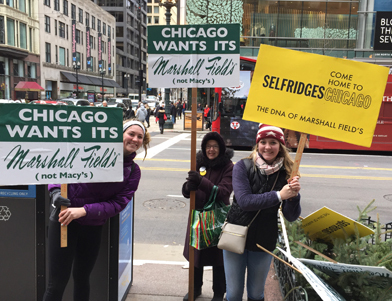 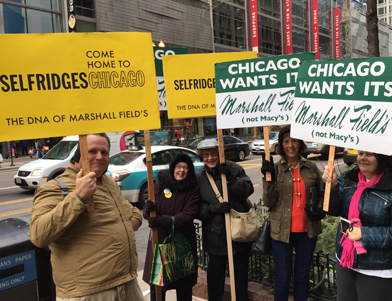 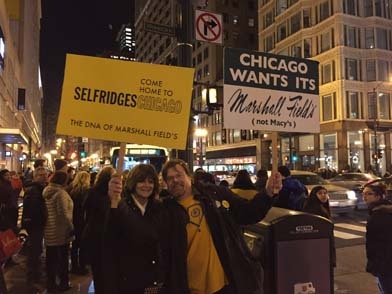 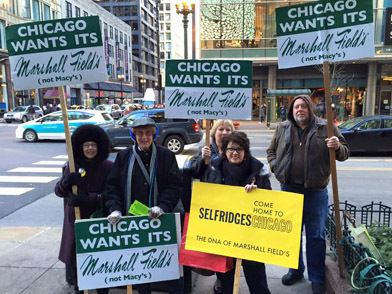 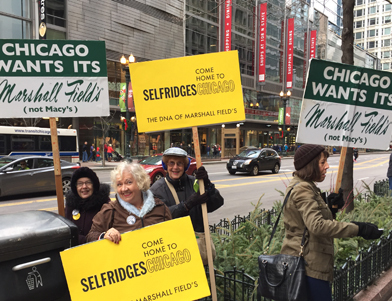 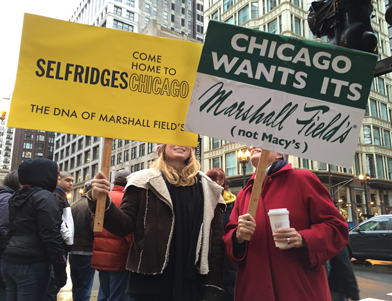 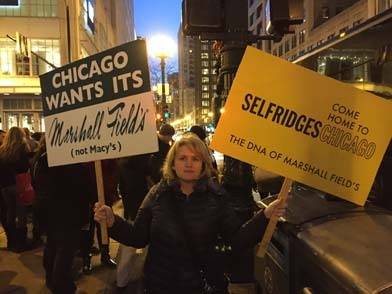 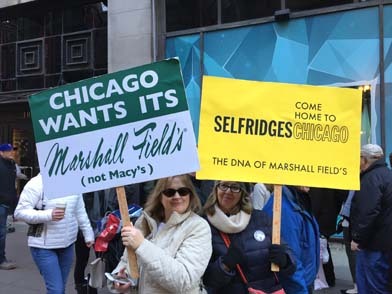 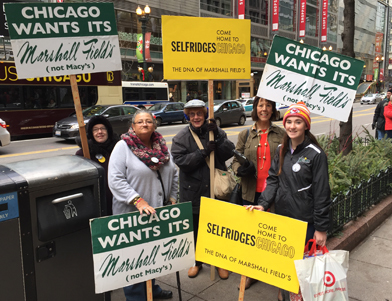 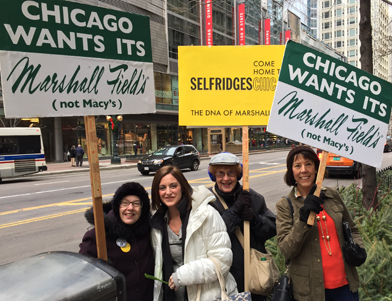 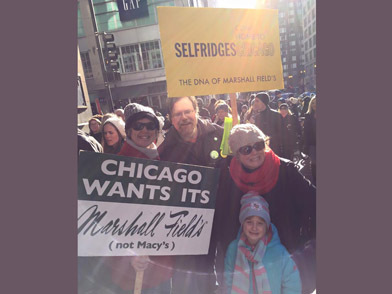 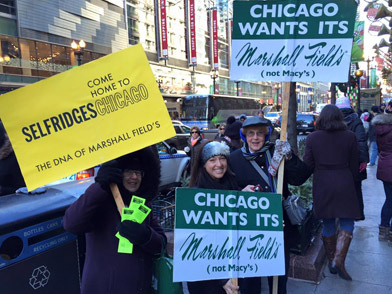 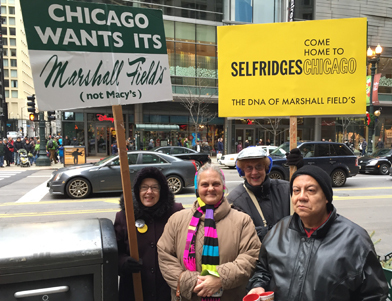 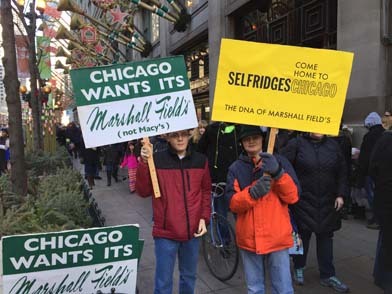 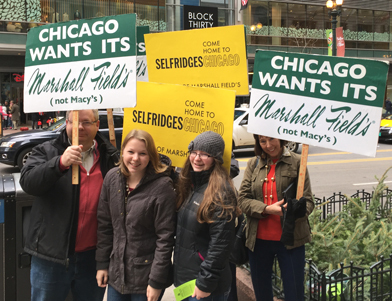 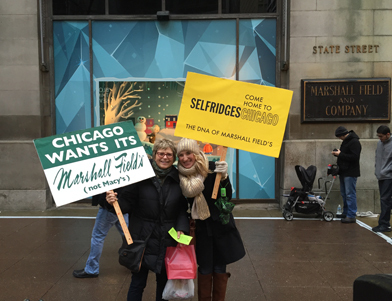 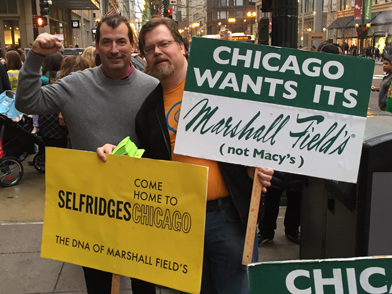 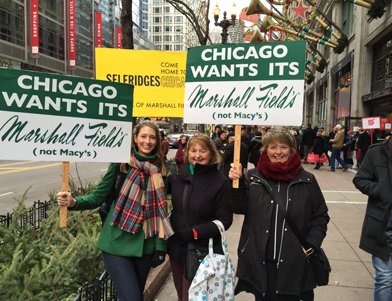 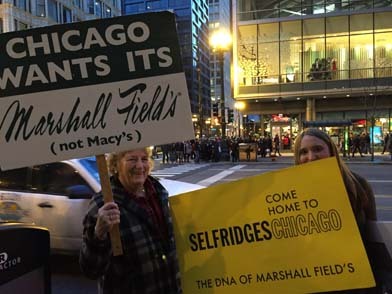 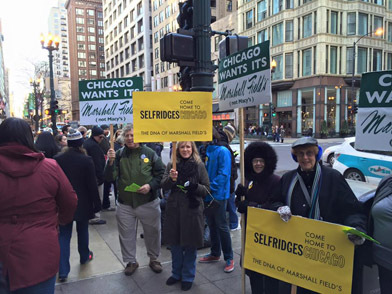 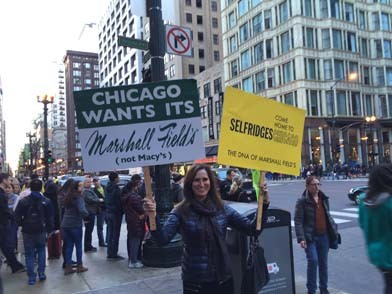 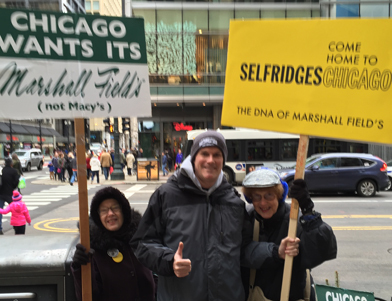 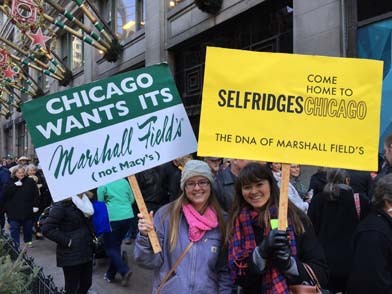 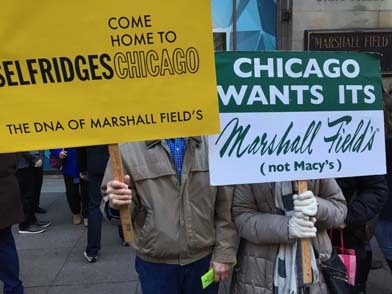 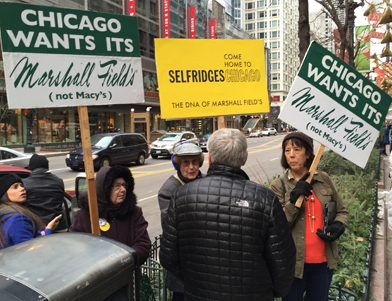 With Macy's rumored to be a potential buyout target, we're recruiting potential buyers who would recognze the $419M value that is associated with the Marshall Field's trade name. 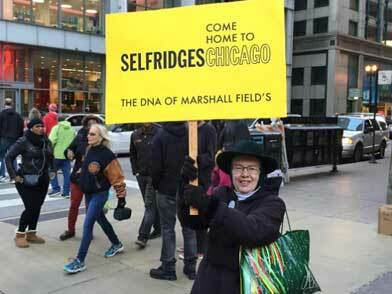 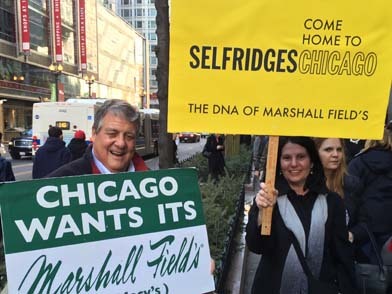 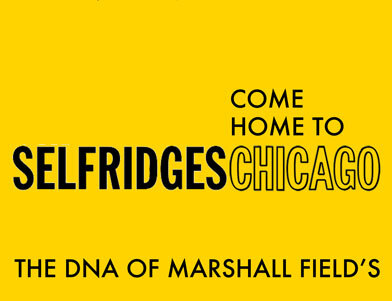 The owners and operators of London's Selfridges are at the top of our list. 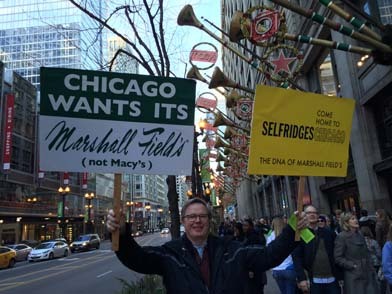 Word has it that Hudson's Bay could also be an interested acquirer of Macy's/Bloomingdale's.